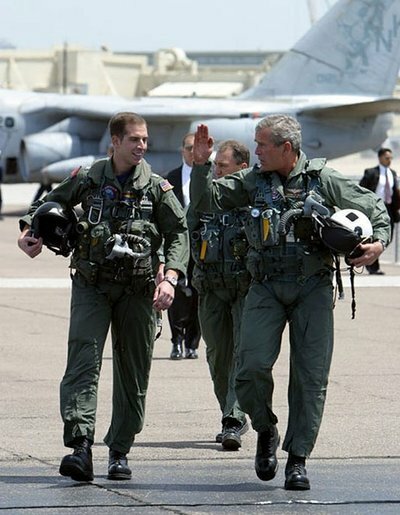 Has anyone noticed that our commander-in-chief no longer plays dress up? He hasn’t done so for a while and that’s no small thing. It’s a phenomenon that came and went almost without comment in the media. Here’s something I suspect goes with the above. With rare exceptions, the fiercest post-9/11 "warriors" of this administration were never in the military. They had, in the Vice President’s words, "other priorities in the ‘60s." Hence that old (and not very useful) term "chickenhawks." On the other hand, a surprising number of Democrats in Congress had actually served in the military — not that, from Senators Max Cleland and John Kerry to Jack Reed, it’s done them much political good. Americans have preferred, it seems, to hear their war stories from the men who sat out the wars. The reason, I suspect, is simple enough. I’m about George Bush’s age. My father, like his, fought in Asia in World War II. In the 1950s, my childhood years, that generation of fathers — the ones I knew, anyway — were remarkably silent on their actual war experiences, but to us kids that made no difference. All we had to do was walk to the nearest neighborhood movie theater, catch Merrill’s Marauders, or some other war flick, and it was obvious enough just what heroic things they had accomplished. George Bush and I both sat in the dark, enveloped in the same American mythic tradition — already then a couple of hundred years old — that I’ve called "victory culture"; we knew Americans deserved to, and would, triumph against savage enemies out on some distant frontier; we both thrilled to the sound of the bugle as the blue coats charged; we both felt the chills run up our spine as, with the Marine Hymn welling up, the Marines advanced victoriously while "The End" flashed on the screen. Here’s the difference: I left that movie theater in the Vietnam era. 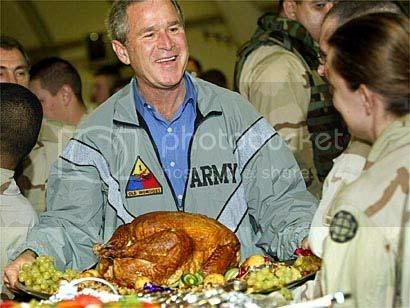 Much of the Bush administration seems to have remained in the dark. There, it seems, they sat out defeat and emerged strangely untouched, as I’ve written elsewhere, as the Peter Pans of American war play. While, in the 1980s, G.I. Joe shrunk to 3¾-inch size to squeeze into the Star-Wars universe and began fighting fantasy villains, while others absorbed the Vietnam lesson, they arrived in the post-9/11 moment with a still untarnished dream of American triumphalism. And that, as Ira Chernus makes clear in a recent essay, "Glued to Our Seats in the Theater of War," is what Americans wanted–and many, against all odds, still want–to hear. The President and his top officials were the ones who could still embody the idea of a "Good War," both enjoying the performance themselves and making it seem thrilling; and, for some years, a remarkable number of Americans suspended Vietnam-style disbelief and went with the flow. Under the circumstances, a surprising number still do. It just turned out–and who in the "reality-based" world can truly be surprised–that they couldn’t translate their all-American fantasy world, or the President’s dress-up dreams, into reality. Fighting actual wars proved a painfully different matter.